Last year I enjoyed taking an apologetics class with John Armstrong through the M.A. program I’m in at Wheaton. Though the content of the class was good it was an unplanned experience that caused me to see John’s commitment to unity and peace. A classmate was feeling attacked in a discussion we were having. We could all feel the emotional temperature in the room shift and wondered if things were going to move from a simmer to boiling. The discussion got more heated resulting in my classmate yelling at John and storming out of class. Needless to say this was a shock to all of us and a disturbance to the class. Though John, as the professor of the class could have spent the next portion of time justifying his teaching style or defending his arguments he did something that showed his dependance upon Jesus and his commitment to unity among Christians- he invited all of us to pray for the classmate and for one another. That very week John pursued my angry classmate, cared for him and they reconciled. Now, a year later that same classmate is helping John with publicity for his book, Your Church is Too Small. 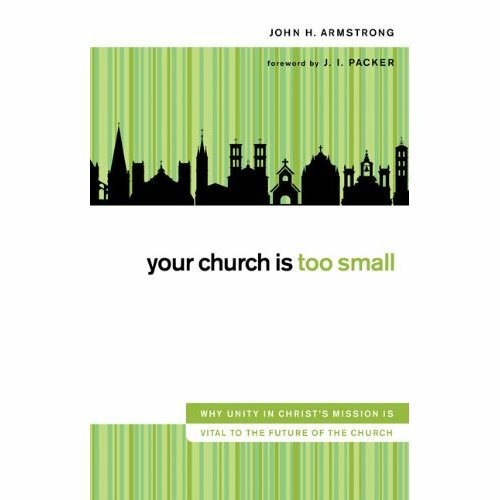 Your Church is Too Small is a combination of John’s personal journey, historical and theological exploration into the intertwined truths and mission of Christians from diverse backgrounds. John’s excitement for the future of the church is clear in this book- there are so many good ways that we can learn about Jesus from scripture, one another and history! He presses into questioning why we limit ourselves to small understandings of what it means to be the church when we serve a God who is so big with a mission that is so great- to demonstrate his power of love and unity to the world. I especially appreciated his review of the Christian Statesman John R. Mott as a historical example of building bridges with diverse peoples for the sake of Christian unity. Having just read a brief book on Mott for another class it was encouraging to read about Mott’s work for international peace and his commitment to helping college students do the same . If you are a pastor, church planter or someone who is seeking to understand how to build unifying bridges for the sake of Christ and his church, this book will be a boon to your journey. As part of the blog tour for this book, I was given an advance copy of the book to review. I wasn’t required to write a positive review, simply to give my thoughts and opinions. If you’re interested in the book you can pre-order it on amazon or check out the website. May God continue to use John, books like this and many others to demonstrate the goodness of Jesus in our world! I saw your testimony on the ACT3video and want to thank you for adding this precious adornment to unity and peace of Christians. You correctly use “must” is speaking of the way forward in the new millenium and our being faithful to our calling. Sounds like you are enjoying your classes. I enjoyed visiting your blog and will be back. Have a great spring. I’m catching up on your blogs tonight. This sounds like an excellent book. Thanks for the book review and your comments.